Shopping at the flea market is hit or miss. Sort of like shopping at Marshalls or TJ Maxx. On one trip, you may discover so many treasures that you can re-decorate your entire home in one fell swoop. On the next trip, you might not be able to find a toilet bowl brush that you like. I wish I could say that I was shopping at the Flea Market, Marché aux Puces, in Paris. And I could say that. But it wouldn’t be true. Alas, I am still in Pennsyltucky. On our visit to the flea market today, we saw vendors selling flowers (fleurs) and fireworks. New socks (nouvelles chaussettes) and used shoes. Make-up (maquillage) and a machine gun?! Yes, a machine gun and more shotguns and rifles than I could count. I am most definitely still in Pennsyltucky. Some had pockets that were filled with dirt and used as planters. They also had some with solar powered lights attached. The seller claims that he pulls the stumps out of rivers. 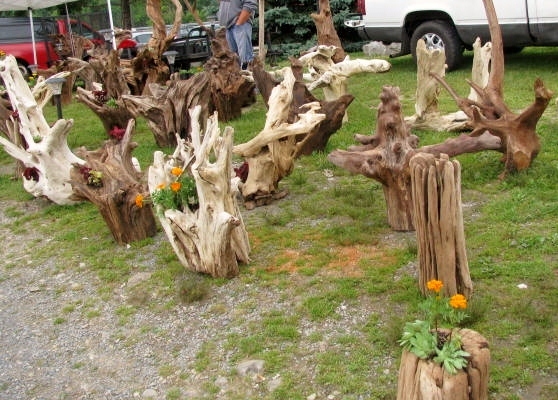 Technically, driftwood comes from the sea, so these are really riverwood stumps, not driftwood stumps. Perhaps I should mention that the next time I see him. Perhaps not. There was a man selling stenciled signs. 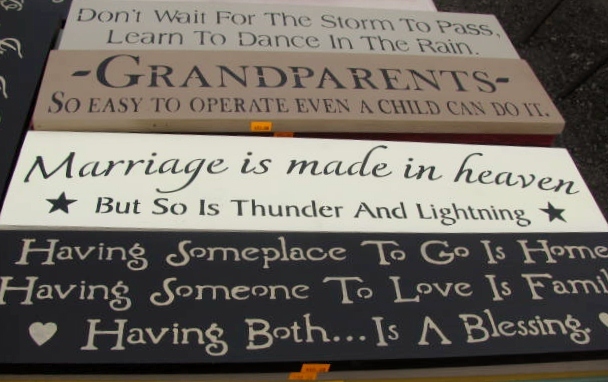 I liked the one about marriage. 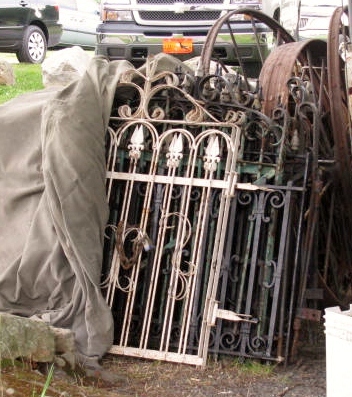 I was really interested in a piece or two of this wrought iron fence and decided, since we would pass it on our way out, that I would inquire about it then. However, the vendor was gone when we passed by later. A gray sky was looming and some of the sellers packed up early. Which may be the reason that I got such a good deal on this item. 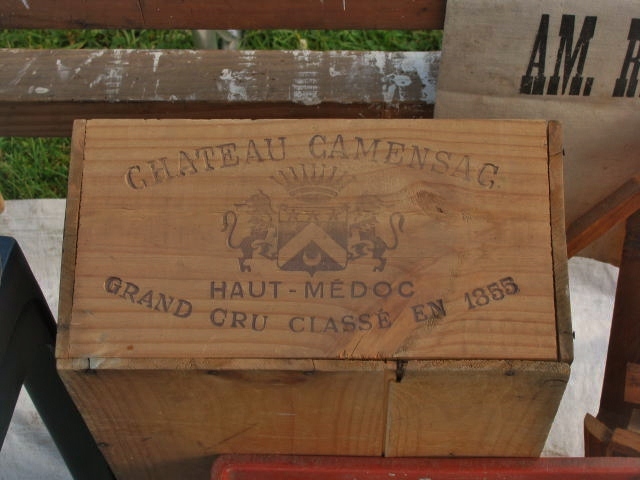 The French treasure (le trésor français) – a wood wine crate for $1. Now I just need to figure out what I’m going to do with it. Hang it on the wall as a shelf? Dismantle the box and make a wall-hanging with the end piece? Or turn the end piece into a trivet? Thoughts? Suggestions? I welcome your crafty ideas! While you’re consider the possibilities why not fill the box with a lovely picnic meal, including some frensh napkins and wine, and just enjoy a Sunday afternoon with friends or family? I like the sign idea. It’s hard to gauge the size but what about a magazine storage box? Riverwood stump….LOL! 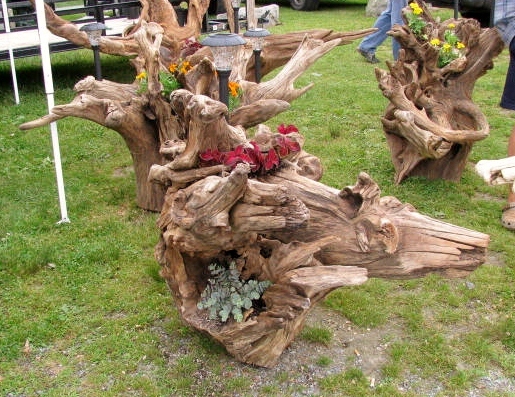 I love the tree stump lawn ornaments, and just about anything else made out of wood. I agree. I thought they were interesting and had never seen them before. But then again, I don’t get out of the woods very often… Merci! I love that wooden box! What a deal! I would proably leave it as a box…magazines, maybe storage in your kitchen???? office storage/file “cabinet”??? The possibilities are endless!